Introduction: Dry-eye syndrome (DES) is a general eye disease. Eye drops are the common ophthalmological medication. However, the ocular barrier makes it difficult to attain high drug bioavailability. Nanomedicine is a promising alternative treatment for ocular diseases and may increase drug content in the affected eye. Methods: To explore this potential, we constructed nanoparticles (NPs) containing an anti-inflammatory agent for DES treatment. The NPs were made of gelatin–epigallocatechin gallate (EGCG) with surface decoration by hyaluronic acid (HA) and designated “GEH”. The particle size, surface charge, and morphology were evaluated. The in vitro biocompatibility and anti-inflammation effect of nanoparticles were assayed via culturing with human corneal epithelium cells (HCECs) and in vivo therapeutic effect was examined in a DES rabbit’s model. Results: The synthesized GEH NPs had a diameter of approximately 250 nm and were positively charged. A coculture experiment revealed that 20 µg/mL GEH was not cytotoxic to HCECs and that an EGCG concentration of 0.2 µg/mL downregulated the gene expression of IL1B and IL6 in inflamed HCECs. Large amounts of GEH NPs accumulated in the cytoplasm of HCECs and the ocular surfaces of rats and rabbits, indicating the advantage of GEH NPs for ocular delivery of medication. Twice-daily topical treatment with GEH NPs was performed in a rabbit model of DES. The ocular surface of GEH-treated rabbits displayed normal corneal architecture with no notable changes in inflammatory cytokine levels in the cornea lysate. The treatment improved associated clinical signs, such as tear secretion, and fluorescein staining recovered. Conclusion: We successfully produced GEH NPs with high affinity for HCECs and animal eyes. The treatment can be delivered as eye drops, which retain the drug on the ocular surface for a longer time. Ocular inflammation was effectively inhibited in DES rabbits. Therefore, GEH NPs are potentially valuable as a new therapeutic agent delivered in eye drops for treating DES. Ophthalmic solutions delivered as eye drops are preferred because of the low cost and ease of use by patients at home. However, the unique anatomic structure of eyes presents some disadvantages for the topical delivery of medicines in the form of eye drops. The limitations include limited drug retention, which results in poor bioavailability of ocular drugs, a short burst of drug availability with marked variation in quantity, and nasolacrimal duct drainage.1,2 The administered dose permeates to the eye after 5 minutes with only 5% retention.3 Designing a drug-delivery system to increase the content of drug that is actually retained on the eye surface is an important goal in ophthalmology. Many studies for ocular drug delivery have focused on elevating the drug concentration in the cornea/conjunctiva to improve the treatment efficacy of extraocular diseases. These efforts have involved colloidal drug-delivery systems, such as liposomes,4 nanospheres,5,6 and nanoparticles (NPs).7–10 NPs can encapsulate and protect the gene/drug from degradation during transport, enhance cellular uptake in the cornea, and increase the intraocular half-life of the enclosed molecules.11 Gelatin NPs (GPs) have been used for topical delivery due to their biodegradability and biocompatibility.12 In addition, collagen is the main component of the corneal stroma and the source for the preparation of gelatin. Gelatin has been used for ophthalmic applications,13 and cationic GPs used as an ocular drug carrier are nontoxic, do not irritate rabbits’ eyes, and can be retained in the cornea longer than other ophthalmic solutions.14 Therefore, gelatin was selected as the raw material to prepare the nanocarrier for ocular drug delivery in this study. During eyelid blinking, mucins in the tear fluid act as lubricants in the cornea–conjunctiva interface. They maintain preocular tear-film stability while providing a physical barrier to the entry of pathogens.15 Hyaluronic acid (HA) is a natural polysaccharide with mucoadhesive properties similar to mucins. HA can help retain the applied drug/gene on the ocular surface. The use of HA with chitosan NPs can result in a high transfection rate of genes to ocular tissues.9 Therefore, NPs with surface decoration of HA could increase the interaction of particles on the corneal surface while increasing the concentration retained and time of the therapeutic agent spent on the eye. Dry-eye syndrome (DES) is a multicause disease of tears on the surface of the eye. Symptoms include discomfort, visual disruption, and unstable tear film, with potential damage to the ocular surface.16,17 Inflammation of the ocular surface and hyperosmolality of tears in DES are now recognized as major mediators of inflammatory response.17 Overexpression of pro-inflammatory cytokines has been documented in patients with DES,18,19 as has the involvement of inflammatory cytokines, including IL1β, IL6, IL17, CCL2, IFNγ, and TNFα, in ocular inflammation associated with DES.19,20 Polyphenols contained in green tea are influential in the physiology of vision and the condition of the eye.21 These tea polyphenols possess antioxidant and anti-inflammatory properties.22,23 Epigallocatechin gallate (EGCG) is a major polyphenol of green tea. EGCG inhibits inflammation-related autoimmune disorders22 and is therapeutic in several inflammatory diseases that include arthritis, atherosclerosis, and DES.22,24 However, the lipophilic nature of the cornea epithelium is a barrier for hydrophilic drugs, such as EGCG. Therefore, lipid NPs loaded with EGCG display better ocular bioadhesion and improved EGCG retention on the eye, due to the electrostatic attraction between the negatively charged ocular mucosa and the positively charged cationic NPs loaded with EGCG.25 As such, NPs containing an anti-inflammatory agent, such as EGCG, are potentially valuable for use in ophthalmology. This study was undertaken to develop a nanomedicine made of a biodegradable polymer (gelatin–HA) loaded with an anti-inflammatory agent (EGCG) that can be applied as eye drops for DES treatment. Characterizations of NPs and in vitro examination by human corneal epithelium cells (HCECs) were performed. Osmolality, pH, and the refractive index (RI) of various EGCG formulations in eye drops were analyzed. A rabbit model of DES was established to explore the therapeutic effect of gelatin–EGCG (GE) with HA coating (GEH) NPs as a nanomedicine in vivo via tear-production evaluation, fluorescein staining, histological examination, and ELISA quantification of inflammatory cytokines in the cornea. Gelatin type A (bloom 110 from porcine skin), EGCG (≥95%), potassium persulfate (K2S2O8), 2,2′-azino-bis(3-ethylbenzothiazoline-6-sulfonic acid) diammonium salt (ABTS), lipopolysaccharide (LPS), Cell Counting Kit 8 (CCK-8), live/dead cell double-staining kit, and benzalkonium chloride (BAC) were acquired from Sigma-Aldrich (St Louis, MO, USA). Sodium hyaluronate 1% was purchased from Maxigen (New Taipei City, Taiwan). Mixed 5(6)-carboxytetramethylrhodamine (TAMRA) succinimidyl ester isomers, penicillin–streptomycin–neomycin, DAPI, and Trizol reagent were acquired from Thermo Fisher Scientific (Waltham, MA, USA). The Vivaspin 500 ultrafiltration device (molecular weight: 30 kDa) was bought from Sartorius (Göttingen, Germany). Spectra/Por membrane dialysis products (molecular weight: 3,500 Da) were acquired from Spectrum Labs (Rancho Dominguez, CA, USA). PBS, insulin, trypsin–EDTA, keratinocyte serum-free medium, and bovine pituitary extract were secured from Thermo Fisher Scientific. FNC coating mix (containing fibronectin, collagen, and albumin) came from Athena Environmental Sciences (Baltimore, MD, USA). EGF was purchased from PeproTech (Rocky Hill, NJ, USA). A high-capacity cDNA reverse-transcription kit and TaqMan fast universal master mix (2×) were acquired from Thermo Fisher Scientific. Zoletil 50 solution was acquired from Virbac Animal Health (Carros, France), and 2% Rompun was bought from Bayer (Leverkusen, Germany). Topical anesthesia solution (Alcaine 0.5%) was purchased from Alcon (Hünenberg, Switzerland). Schirmer strips and fluorescein paper strips came from Madhu Instruments (New Delhi, India) and Haag-Streit (Köniz, Switzerland). An Apo-BrdU-IHCTM in situ DNA-fragmentation assay kit was bought from BioVision (Milpitas, CA, USA). The rest of the chemicals were purchased from Sigma-Aldrich. 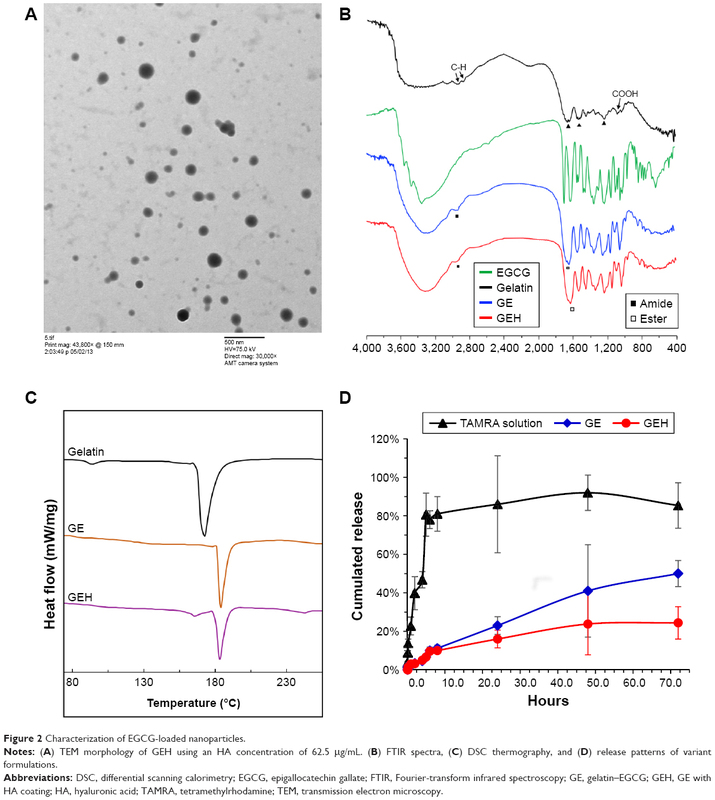 EGCG and NPs were synthesized by a previously described self-assembly method with slight modifications.26 Type A gelatin and EGCG solution were mixed by magnetic stirring using the same volume (1 mL) and concentration (4.4 mg/mL). The self-assembly of the two components to yield GE (Figure 1A) occurred during the mixing. Subsequently, 100 μL HA at various concentrations (62.5, 125, and 250 μg/mL) was added to 1 mL GE colloidal solution. The HA was deposited on the surface of the GEH NPs (Figure 1A). Figure 1 Schematic representations of (A) self-assembled GE and GEH NP formation and (B) photograph of these colloidal solutions. Abbreviations: EGCG, epigallocatechin gallate; GE, gelatin–EGCG; GEH, GE with HA coating; HA, hyaluronic acid; NP, nanoparticle. The ζ-potential and size of the GE and GEH NPs were examined using a dynamic light scattering (Zetasizer Nano ZS90; Malvern Instruments, Malvern, UK) at 25°C. Each assessment was made in triplicate. NP morphology was examined by transmission electron microscopy (TEM; HT-7700; Hitachi, Tokyo, Japan). Lyophilized powders of gelatin, EGCG, GE, and GEH NPs were analyzed by Fourier-transform infrared spectroscopy (FTIR; Spectrum 100; PerkinElmer, Waltham, MA, USA) to confirm the chemical components. Samples mixed with potassium bromide were measured in the transmission mode at wavelengths of 400–4,000 cm−1. The thermal behavior of these lyophilized NPs was identified by differential scanning calorimetry (DSC; 200 F3; Netzsch, Selb, Germany). Each 5 mg sample was hermetically closed in an aluminum pan and heated at a rate of 10°C/min from 30°C to 280°C. The tendency of EGCG to oxidize when soaking in the buffer can disrupt the result of high-performance liquid chromatography. Therefore, the TAMRA fluorescence dye was loaded into NPs for the release test instead of EGCG. GEH NPs (1 mL) containing TAMRA were placed in a dialysis membrane, then immersed in PBS (pH 4) at a total volume of 40 mL and incubated in a water bath with magnetic stirring (120 rpm) at 37°C. At defined times, 1 mL sample was removed, centrifuged, and the supernatant assayed using a multifunctional microplate reader (Varioskan Flash; Thermo Fisher Scientific) at an excitation wavelength of 555 nm and emission wavelength of 585 nm. The total released dye represented the accumulated release rate. The cell line originally from HCECs was acquired from the American Type Culture Collection (ATCC, Manassas, VA, USA). The tissue-culture plate was pretreated with FNC coating mix before HCEC seeding. Keratinocyte serum-free medium with 5 ng/mL EGF, 5 ng/mL insulin, 50 ng/mL bovine pituitary extract, and 500 ng/mL hydrocortisone was used as regular culture medium. Viability of HCECs treated with EGCG solution and various concentrations of GE and GEH NPs was determined using the CCK-8. The cells were seeded in 96-well plates (5×103 cells/well) and cultured overnight. HCECs were incubated with EGCG concentrations of 1–1,000 μg/mL for 1 and 3 days. At the times indicated, the culture medium was removed and a 200 μL working solution of water-soluble tetrazolium 8 from the CCK-8 was added to each well. After 4 hours’ incubation, 100 μL reacted solution was examined at a wavelength of 450 nm using a microplate reader (Multiskan GO; Thermo Fisher Scientific). After comparison with control cells (growth medium), the percentage of viable cells was determined. In the live/dead cell-staining test, cells treated with various EGCG formulations were stained with specific dyes to observe cell viability. Cells with green and red fluorescence were viable and dead, respectively. Images were acquired using inverted fluorescence microscopy (IX81; Olympus, Tokyo, Japan). HCECs were added to wells of a 96-well plate overnight prior to treatment with GE or GEH NPs at an EGCG concentration of 100 μg/mL for 1 or 3 hours. NPs containing TAMRA dye (0.5 μg/mL) were used to track their distribution in cells. After incubation, cells were washed several times with PBS and fixed with 10% formaldehyde solution. Subsequently, 0.1% Triton X-100 was added and reacted with cells for 5 minutes, followed by two washes with 20% FBS in PBS. Nuclei were stained with 300 nM DAPI and examined at excitation and emission wavelengths of 358 and 461 nm, respectively, followed by several rinses with PBS. These cells were examined using an ImageXpress Micro XLS wide-field high-content screening system (Molecular Devices, Sunnyvale, CA, USA) and the images analyzed using MetaXpress 5 software (Molecular Devices). Within these images, NPs were defined in a width range of 0.3–3 μm and nuclei clarified by minimum and maximum width (3 vs 15 μm). The number of particles per cell was determined as total particles per total nuclei. Images acquired from six wells for each tested group were used for statistical analysis. HCECs (3×105 cells/well) were seeded in six-well plates and cultured overnight. To induce inflammation, fresh medium containing 500 ng/mL LPS was added and cell incubation continued for 6 hours. Unstimulated HCECs were used as the control. 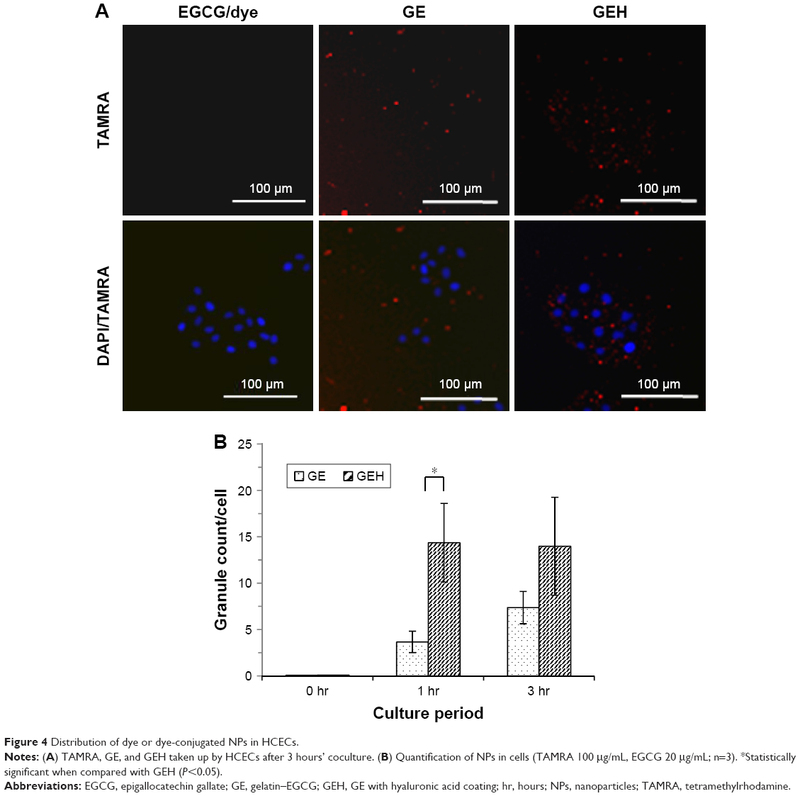 After LPS stimulation, the medium was removed and fresh medium (without LPS) containing EGCG, GE, and GEH NPs were added to culture cells, the EGCG concentration in all groups were the same (0.2 μg/mL EGCG). After 24 and 48 hours of coculture of HCECs with NPs, cells (from four wells) were detached from plates and collected by centrifugation for RNA extraction. The RNA acquired from three repeat tests was used for PCR. Total RNA was extracted by reaction with Trizol reagent following the manufacturer’s protocol. The isolated RNA was kept at −80°C for reverse-transcription PCR. RNA (2 μg/μL) from each group was used, and first-strand cDNA was synthesized according to instructional protocols using the high-capacity cDNA reverse-transcription kit. Real-time PCR was carried out with a LightCycler 96 real-time PCR system (Hoffman-La Roche, Basel, Switzerland) and the TaqMan fast universal master mix. Specific primers (IL1B [Hs01555413], IL8 [Hs00174103], IL6 [Hs00174131], TNFA [Hs00174128], and GAPDH [Hs99999905]) were used for real-time PCR examination. The detailed protocol for the PCR examination is provided in the Supplementary material. The ΔΔCt method was used to quantify relative gene expression. The optimal concentration of the various tested concentrations of EGCG was determined to be 20 μg/mL EGCG based on cytotoxicity and anti-inflammatory results. This concentration was added to the buffer as eye drops for the animal study. To assess physical properties, the pH and osmolality of the eye drops containing GE/GEH NPs were determined using a pH meter (CyberScan PH 510; Eutech Instruments, Singapore) and a model 3,320 micro-osmometer (Advanced Instruments, Norwood, MA, USA), respectively. RI values of the colloidal solutions were determined by refractometry (DR-A1; Atago, Tokyo, Japan). PBS was used as the basal solution to dilute NPs to the desired concentration. This colloidal solution was sterilized by filtration through a 0.22 μm filter for the animal study. The eye drops did not contain preservative. Wistar rats were used to monitor the distribution of fluorescence-labeled NPs on the ocular surface, because of the limitations of the in vivo imaging system (IVIS) imaging chamber (Xenogen, Alameda, CA, USA). Rats were used for live-image observations and rabbits for in vivo DES evaluation. GE and GEH NPs containing 20 μg/mL EGCG were conjugated with a red fluorescent dye for observation. The rats were anesthetized and eye drops containing fluorescent NPs added directly. Two rats from each group was examined for two repeats (the same rat was imaged after a 2-day interval to minimize the influence of the previous test). The three groups were the control (untreated eyes to eliminate background signal), EGCG (EGCG alone), and GE/GEH NPs containing TAMRA dye. Following application of eye drops, the eyes were photographed. Tissue autofluorescence was accounted for to decrease background interference. The resulting fluorescence-intensity signal was used for calculation (n=4). A similar test for the topical delivery of NPs to rabbit eyes was performed 2 hours after the eye drops had been administered. Entire eyeballs from each rabbit were extracted and examined using the IVIS. Subsequently, the cornea was cut from the eyeball, put in a tissue well, and soaked in Tissue-Tek optimum cutting-temperature compound. Before storage of the tissue wells at −70°C, they were frozen on dry ice. A cryostat microtome (CM 3050S; Leica Microsystems, Wetzlar, Germany) was used to section the frozen specimens. For nuclear staining, cells were washed with PBS and fixed with 3.7% paraformaldehyde for 30 minutes at room temperature. The fixation solution was discarded and samples washed three times using PBS. Triton X-100 (0.2%) was added for 5 minutes and nuclei stained with DAPI. Samples were fixed in mounting medium and sealed. Laser confocal microscopy (TCS SP5; Leica Microsystems) was used to examine the cornea sections. New Zealand White rabbits (male, 2.5–3.5 kg, 3–6 months of age) with healthy eyes were used. All experimental procedures were approved by the Institutional Animal Care and Use Committee of Taipei Medical University (LAC-100-0165 and LAC-101-0289). Animal experiments in this study adhered to the Association of Research in Vision and Ophthalmology statement for the use of animals in ophthalmic and vision research. Rabbits were maintained in light-controlled conditions of alternating 12-hour periods of light and dark (light from 6 am to 6 pm), temperature of 23°C±2°C, and relative humidity of 60%±10%. An intramuscular injection of a mixture of Zoletil 50%–2% Rompun solution at a 1:2 ratio (1 mL/kg) was used for general anesthesia. The DES-inducement protocol was done as previously described.29 Eyes of the rabbits were treated topically with eye drops (20 μL) containing 0.1% (w:v) BAC three times daily. Clinical observations were made and fluorescein staining done before and after BAC treatment to determine DES induction. After 4 weeks of BAC treatment, rabbits were divided randomly into four groups (n=6) for treatment with 20 μL of eye drop formulations:1 PBS,2 20 μg/mL EGCG solution,3 GEH NPs containing 20 μg/mL EGCG, and 4BAC solution (0.1%) as the negative control. Group 5 comprised untreated healthy rabbits as the positive control. Eye drops were administered twice daily (10 am and 6 pm) for 3 weeks. The rabbits were killed and their corneas used for preparation of histological sections. Before death, the DES of each rabbit was assessed. Tear secretion was quantified using Schirmer strips.30,31 Rabbits were anesthetized to keep them immobile. After dispensing 0.5% Alcaine agent on the eye, the lower eyelid was pulled down slightly and Schirmer strips put on the palpebral conjunctival vesica, which is close to the connection of the middle and outer third of the lower eyelid. After 5 minutes, the wetted length of the strip was recorded. Each eye was examined twice at 30-minute intervals, and the average wetted length was used. 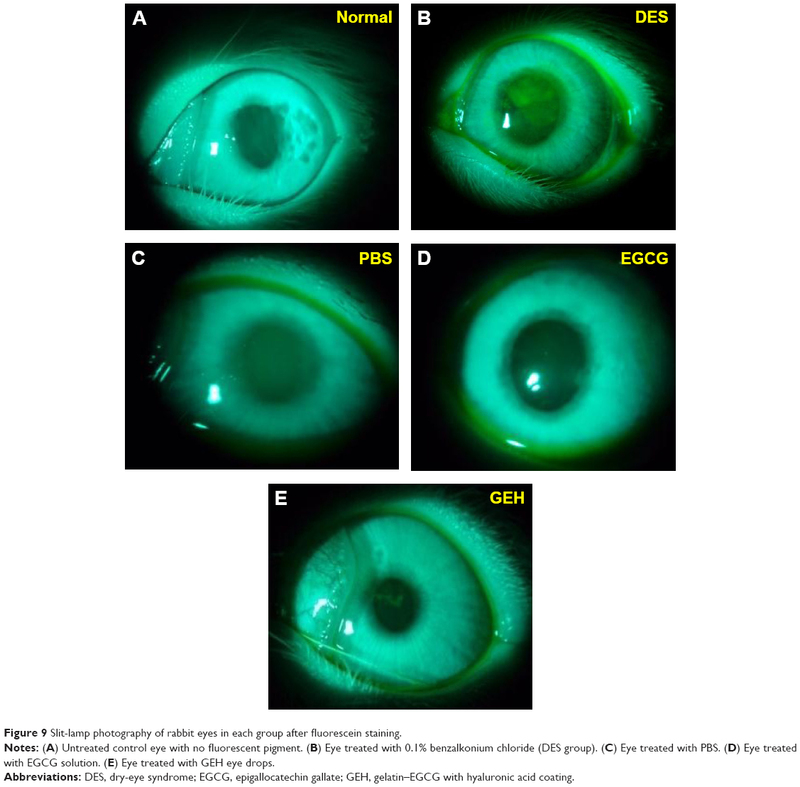 Fluorescein staining was used to check cornea damage before and after the induction of DES.30,32 The therapeutic value of the various EGCG solutions as eye drops was evaluated after the 3-week treatment. Fluorescein sodium was added dropwise to the cornea and conjunctival sac. After 30 minutes, each eye was washed using PBS and examined by slit-lamp microscopy with a cobalt-blue filter (Topcon, Oakland, NJ, USA). Rabbits were killed and corneas removed. Each cornea was cut into two pieces. One piece was fixed in 3.7% formaldehyde buffer solution. The fixed corneas were embedded individually in paraffin and cut into 5 μm-thick sections. The sections were stained with H&E for histological observation. A TUNEL assay of CEC apoptosis24,33 was performed carefully using the Apo-BrdU-IHCTM kit. Sections were observed using optical microscopy (BM-1A; Sage Vision, New Taipei City, Taiwan). The other portion of the cornea was lysed for protein extraction. First, corneas were weighed and chopped into tiny fragments. Then, the tissue was solidified by soaking in liquid nitrogen and ground into powder. This procedure was repeated three times. Tissue lysates were acquired using a tissue protein extraction cocktail (Thermo Fisher Scientific) according to the manufacturer’s protocol. Protein concentration in each tissue extract was quantified using a Coomassie protein assay (Thermo Fisher Scientific) to standardize the protein concentration of the samples for subsequent ELISA. Each sample (100 μL, total protein concentration 0.15 μg/μL) was added to wells of a 96-well plate for ELISA. Rabbit TNFα concentration was confirmed using a DY5670 kit purchased from R&D Systems (Minneapolis, MN, USA). Rabbit IL8, IL6, and IL1β levels were confirmed using MBS2507990, MBS812867, and MBS725024 kits, respectively (MyBioSource, San Diego, CA, USA) according to the supplier’s instructions. All data are presented as mean ± SD from two to three independent experiments. Student’s t-test or one-way ANOVA post hoc tests and Tukey’s test for statistical comparison between group were employed using SPSS 17.0 (SPSS, Chicago, IL, USA). P<0.05 was considered statistically significant. 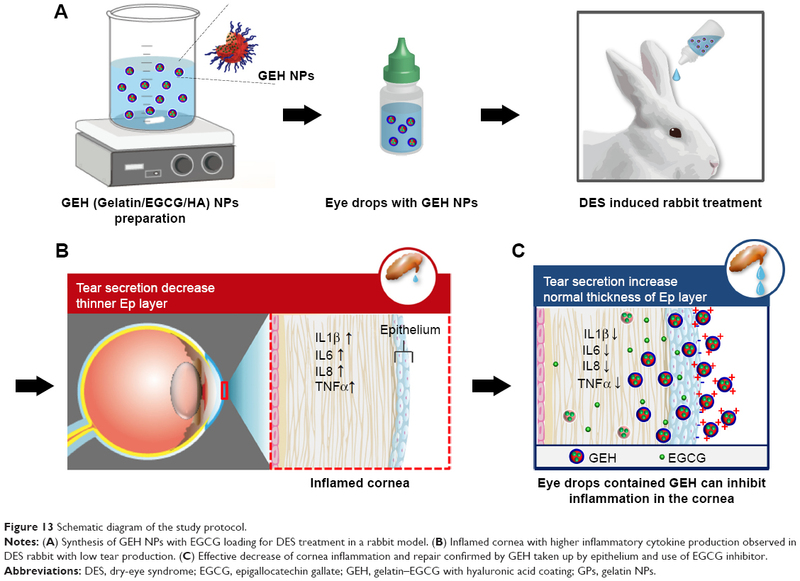 In this study, GEH NPs for ocular drug delivery were developed successfully and used in eye drops to effectively treat DES in rabbits. GE NPs with or without HA surface decoration were prepared and examined. The mean diameter measured by dynamic light scattering of the GE NPs was 142.1±32.6 nm (Table 1). Particle sizes of GE with variable HA concentrations were slightly different: 253.4±7.3 (HA 62.5 μg/mL), 266.1±5.9 (HA 125 μg/mL), and 323.6±31.9 nm (HA 250 μg/mL; Table 1). The ζ-potential of GE was positive (23.2±0.5 mV) and decreased proportionally to the HA added. GEH at the HA concentration of 125 μg/mL displayed a negative ζ-potential (−13.6±2.1 mV). The PDI in all groups was <0.25, which was indicative of a monodisperse colloidal system (Figure 1B). EGCG-encapsulation efficiency in all groups exceeded 97%, which was highly efficient (Table 1). HA was added to increase adhesion of NPs to mucus. Also, we needed to maintain the cationic surface charge of the NPs. Only the group with 62.5 μg/mL HA addition fulfilled this requirement. As such, GEH with 62.5 μg/mL HA (abbreviated GEH) was used in all subsequent experiments. Note: Values represent mean ± SD (n=3). Abbreviations: EE, encapsulation efficiency; EGCG, epigallocatechin gallate; HA, hyaluronic acid; PDI, polydispersity index. GEH NPs were spherical on TEM. They did not aggregate, and particle size was approximately 100–150 nm (Figure 2A). Figure 2B shows FTIR spectra of gelatin and self-assembled GE NPs and GEH NPs. The FTIR spectrum of gelatin demonstrated the typical pattern, reflecting the amide I, II, and III bands at 1.623, 1,546, and 1,226 cm−1, respectively. The coil structure of gelatin was evident by the amide I band at 1,623 cm−1. The absorption band at 1,651 cm−1 was assigned to C=O bending.34 The 2,938 cm−1 and 2,968 cm−1 bands in the spectrum of gelatin were contributed to by the C−H bond, and a carboxyl-group stretching vibration at 1,160 cm−1 was observed.35,36 The FTIR spectrum of EGCG contained absorption bands at 3,559, 3,421, and 3,359 cm−1 due to vibration of the O−H linkage of phenolic hydroxyl groups.36–38 Characteristic peaks of EGCG at wave numbers 825, 1,041, 1,096, 1,146, 1,234, 1,344, 1,450, 1,525, 1,620, and 1,693 cm−1 were assigned to alkenes (C−H), alcohols (−C−O), alcohols (C−OH), −OH aromatics (−OH), alcohols (C−O), alkanes (C−H), aromatic ring (C=C), and alkenes (C=C), respectively.38 The characteristic band of EGCG at 1,234 cm−1 indicated the retention of the −OH aromatic in the GE. Figure 2 Characterization of EGCG-loaded nanoparticles. Notes: (A) TEM morphology of GEH using an HA concentration of 62.5 μg/mL. (B) FTIR spectra, (C) DSC thermography, and (D) release patterns of variant formulations. Abbreviations: DSC, differential scanning calorimetry; EGCG, epigallocatechin gallate; FTIR, Fourier-transform infrared spectroscopy; GE, gelatin–EGCG; GEH, GE with HA coating; HA, hyaluronic acid; TAMRA, tetramethylrhodamine; TEM, transmission electron microscopy. In the pattern of GE NPs or GEH NPs, peaks from gelatin and EGCG were observed. The peaks at 2,950 and 1,645 cm−1 represented amide and ester linkages from gelatin to gelatin and gelatin to GE, respectively.39 The results implied that the GE/GEH we prepared contained both EGCG and gelatin with chemical binding. Changes in the characteristic peaks at 3,359 cm−1 produced a broad peak from 3,550 to 3,300 cm−1, indicating the altered gelatin interaction of the phenolic hydroxyl of EGCG and the aliphatic side chain.38 Although GEH NPs were decorated with HA on their surfaces, the amount of HA was too low to be detected by FTIR. In addition, the carboxylate-associated peaks at approximately 1,610 cm−1 and 1,410 cm−1 overlapped with the peaks of gelatin and EGCG.26,40 Therefore, a similar FTIR pattern of GEH and GE was revealed (Figure 2B). Thermal properties of gelatin and gelatin-based NPs were determined by DSC. As shown in Figure 2C, DSC curves of gelatin featured an endothermic peak at approximately 172.1°C. Endothermal temperatures of the GE became higher (GE 182.9°C, GEH 182.4°C) than those of pure gelatin, which was attributed to the helix-coil structure formation in the GE structure. EGCG cross-linking enhanced the thermal property of gelatin.41 The endothermal peak of gelatin powder mixed with EGCG powder indicated no chemical reaction or influence for the peak (169.0°C) (data not shown). The peak at 165.6°C in GEH indicated the presence of HA (with a peak of 166.7°C). The result revealed the increasingly compact xerogel structure because of hydrogen bonding. EGCG entered the spacing of the polypeptide chains of gelatin to strength the intermolecular interactions. The TAMRA fluorescence dye was used instead of EGCG for drug-release tests in PBS (pH 4) at 37°C. TAMRA was released rapidly in the first 5 hours (approximately 81% of the total), while in the GE and GEH groups, TAMRA encapsulated in NPs released gradually from 5 to 72 hours (Figure 2D). Additionally, the release rate increased from approximately 10% to 50% in GE and to 25% in GEH (Figure 2D). Evaluation of possible cytotoxicity of EGCG and EGCG in GE NPs and GEH NPs was done by assessing the viability of HCECs using the water-soluble tetrazolium 8 reduction assay. EGCG at 200 μg/mL was cytotoxic, with reduction in HCEC viability to <40%, the original level evident after 1 day of cultivation in the EGCG and GE groups. However, viability in the GEH group was higher at 68% of the original level (Figure 3A). No significant toxicity was evident at 20 μg/mL EGCG in the various formulations. Therefore, this concentration was selected for further experiments. HCECs treated with the various formulations containing 20 μg/mL EGCG displayed different results after prolonged treatment. Cells cultured with GEH NPs with loading of 20 μg/mL EGCG displayed the lowest cell viability (40%) at day 7, indicating slow release of effective EGCG from NPs. 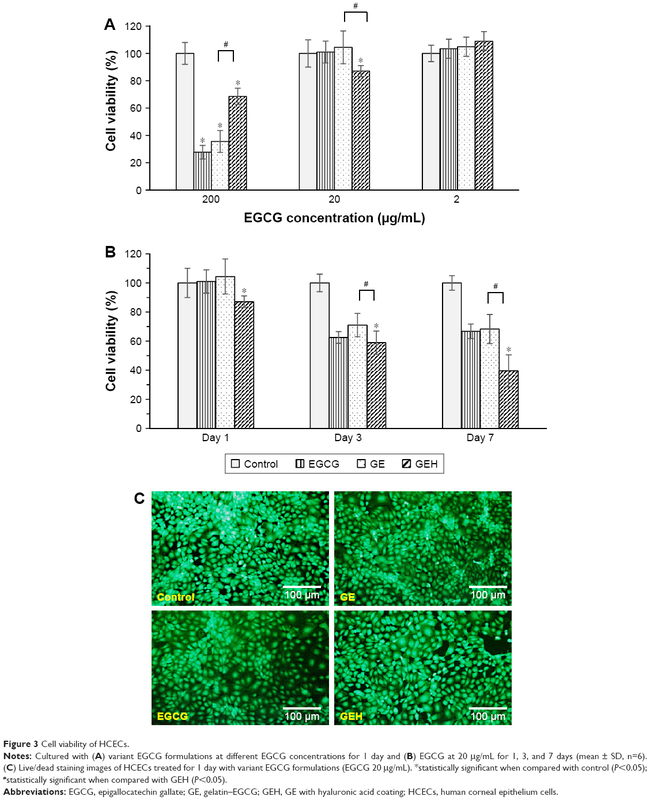 HCECs treated with 20 μg/mL EGCG or GE NPs containing this concentration of EGCG displayed similar cell viability at day 7 (approximately 65%; Figure 3B). The HCEC condition was also verified using live/dead staining for cells treated with the various formulations and with 20 μg/mL of EGCG (Figure 3C). The prevalence of green fluorescent cells was evidence that this concentration of EGCG was not toxic, whether encapsulated or free in solution. Figure 3 Cell viability of HCECs. Notes: Cultured with (A) variant EGCG formulations at different EGCG concentrations for 1 day and (B) EGCG at 20 μg/mL for 1, 3, and 7 days (mean ± SD, n=6). (C) Live/dead staining images of HCECs treated for 1 day with variant EGCG formulations (EGCG 20 μg/mL). *statistically significant when compared with control (P<0.05); #statistically significant when compared with GEH (P<0.05). Abbreviations: EGCG, epigallocatechin gallate; GE, gelatin–EGCG; GEH, GE with hyaluronic acid coating; HCECs, human corneal epithelium cells. Intracellular uptake of NPs was investigated by tracking fluorescence-labeled NPs. Images of HCECs treated with TAMRA alone and encapsulated in GE NPs and GEH NPs for 3 hours are shown in Figure 4A, and quantified data are presented in Figure 4B. The highest fluorescence signal was acquired in GEH-treated cells (approximately 15 particles per cell) at 1 and 3 hours. GE-treated cells displayed 5±0.01 and 7±1.56 particles per cell at 1 and 3 hours, respectively. HA decoration on the surface of GE greatly improved accumulation in the HCECs. Figure 4 Distribution of dye or dye-conjugated NPs in HCECs. Notes: (A) TAMRA, GE, and GEH taken up by HCECs after 3 hours’ coculture. (B) Quantification of NPs in cells (TAMRA 100 μg/mL, EGCG 20 μg/mL; n=3). *Statistically significant when compared with GEH (P<0.05). Abbreviations: EGCG, epigallocatechin gallate; GE, gelatin–EGCG; GEH, GE with hyaluronic acid coating; hr, hours; NPs, nanoparticles; TAMRA, tetramethylrhodamine. The anti-inflammatory effects on LPS-stimulated HCECs were evaluated after 24 and 48 hours. Fold changes in gene expression of IL1B, IL6, IL8, and TNFA in the HCECs in which inflammation was stimulated by incubation with LPS, EGCG, GE NPs, and GEH NPs are presented in Figure 5. All formulations were tested at an EGCG concentration of 0.2 μg/mL. LPS-treated HCECs displayed high expression (two- to sevenfold increase) of IL1B, IL6, IL8, and TNFA compared with normal HCECs (control group as the base line). IL1B, IL6, and IL8 expression was significantly inhibited in cells treated with GE NPs or GEH NPs after 24 hours, but the level of TNFA did not differ between the groups (Figure 5A). The expression of these pro-inflammatory cytokines was not remarkably downregulated in EGCG-treated cells after 24 and 48 hours. 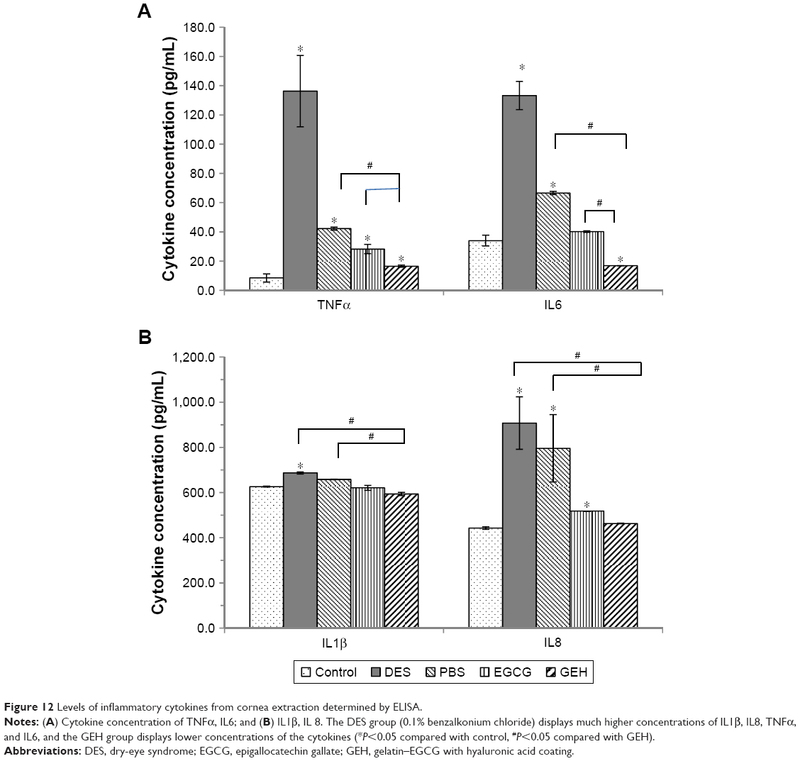 Gene expression of TNFA, IL8, and IL6 was obviously downregulated in cells treated with GEH NPs at 48 hours, and GE-treated cells displayed reduced expression of IL1B and IL8 after the same period (Figure 5B). Figure 5 Expression of IL1B, IL6, IL8, and TNFA in HCECs after (A) 24 and (B) 48 hours of treatment with various EGCG formulations. Abbreviations: EGCG, epigallocatechin gallate; GE, gelatin–EGCG; GEH, GE with hyaluronic acid coating; HCECs, human corneal epithelium cells; LPS, lipopolysaccharide. Human tears are neutral (pH 6.5–7.6),42 and their osmolality ranges from 260 to 340 mOsm/kg.43 The RI of human tears is approximately 1.33698±0.00110.44 pH values of the EGCG solution, GE, and GEH were also neutral (~pH 7.4) and their osmolality ranged from 281 to 291 mOsm/kg (Table 2). The pH value of GEH NPs in PBS was 7.44±0.07 and osmolality 291±11.1 mOsm/kg (Table 2). These osmolality values were marginally lower than those of natural human tears, but were in an acceptable range. The RI was approximately 1.3345, similar to that of human tears. Note: *n=3, all formulations contained EGCG: 20 μg/mL. Abbreviations: EGCG, epigallocatechin gallate; GE, gelatin–EGCG; GEH, GE with hyaluronic acid coating. To confirm the advantage of using the nanoformulation to prolong the retention of a therapeutic compound on the ocular surface, the TAMRA fluorescent dye was loaded into NPs to explore the distribution of particles in the anterior part of the eye. Representative photographs of eyes of rats used in this experiment are shown in Figure 6A. After a 5-minute exposure to the eye drops, the rats treated with GE (relative fluorescence intensity 2.03±0.16-fold) and GEH (2.58±0.28-fold) exhibited higher fluorescence intensity than rats treated with the EGCG solution (1.32±0.21-fold). 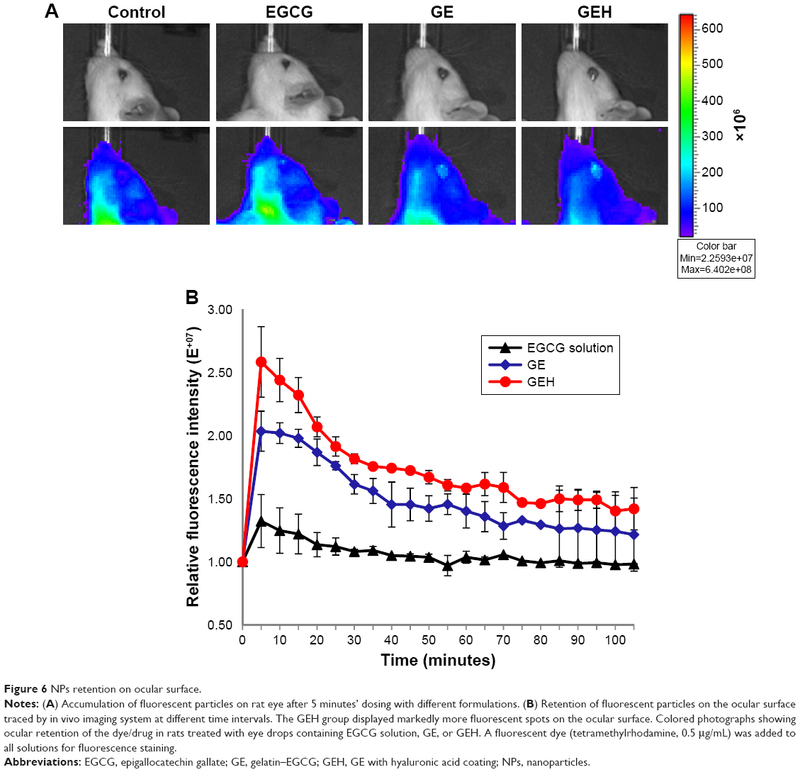 The highest fluorescence intensity was evident in the GEH group, which was markedly higher than the fluorescence intensity in EGCG- and GE-treated rats after 100 minutes (Figure 6B). Figure 6 NPs retention on ocular surface. Notes: (A) Accumulation of fluorescent particles on rat eye after 5 minutes’ dosing with different formulations. (B) Retention of fluorescent particles on the ocular surface traced by in vivo imaging system at different time intervals. The GEH group displayed markedly more fluorescent spots on the ocular surface. Colored photographs showing ocular retention of the dye/drug in rats treated with eye drops containing EGCG solution, GE, or GEH. A fluorescent dye (tetramethylrhodamine, 0.5 μg/mL) was added to all solutions for fluorescence staining. Abbreviations: EGCG, epigallocatechin gallate; GE, gelatin–EGCG; GEH, GE with hyaluronic acid coating; NPs, nanoparticles. The same experiment was done in rabbits. However, since rabbits were too big to put into the observation chamber, they were killed 2 hours after administering eye drops and eyeballs removed and put in the chamber for IVIS examination. Eyes treated with GEH displayed the strongest fluorescence signal (Figure 7A), which was similar to the result from the rat experiments. Cornea cryosections were examined by confocal microscopy. A red spot representing GEH NPs was observed in the upper layer of the cornea localized within the epithelial cell layers (Figure 7B). There was no red fluorescent image in the EGCG–dye group (Figure 7B). The cornea sections provided direct evidence that GEH NPs were retained in the cornea and of uptake by CECs (Figure 7C). These findings indicated that NPs can enable the dye/drug to be retained on ocular surfaces and that GEH NPs decorated with HA can significantly enhance NP retention on the cornea by promoting mucoadhesion of the dye–drug via HA on the ocular surface. Therefore, GEH NPs were chosen for the eye drops tested in the animal study for treatment of DES. Figure 7 NPs location and distribution in cornea. Notes: (A) Accumulation of fluorescent particles on rabbit eye after 2 hours’ dosing with different formulations captured by in vivo imaging system. (B and C) Confocal microscopy of dye or NP distribution in corneal epithelium from a cryosection of rabbit cornea in images at (B) low and (C) high magnification (TAMRA 0.5 μg/mL). Abbreviations: EGCG, epigallocatechin gallate; GE, gelatin–EGCG; GEH, GE with hyaluronic acid coating; NP, nanoparticle; TAMRA, tetramethylrhodamine. Rabbits were treated with 0.1% BAC three times daily for 4 weeks to produce DES. The rabbits were treated with the different eye drop formulations twice daily for 3 weeks and the therapeutic effects examined. 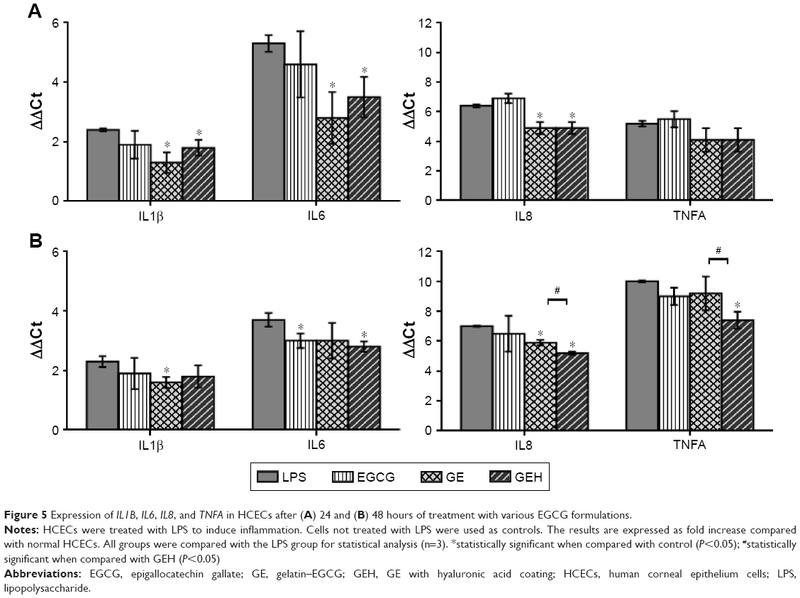 Cellular uptake (Figure 4), anti-inflammation (Figure 5), and ocular retention (Figure 6) results showed better anti-inflammation effects and more prolonged eye/cornea retention for GEH NPs (Figures 6 and 7). Therefore, only GEH NPs were evaluated in the DES-therapy test, which adhered to the three Rs (replacement, reduction, and refinement) of animal research design. Tear secretion was assayed after 3 weeks of treatment. Compared with the tear volume in normal eyes (7.2±2.7 mm), tear secretion reduced rapidly in eyes treated with 0.1% BAC (mimicking DES condition, 3.7±1.4 mm). Similar results were obtained from rabbits treated with PBS and EGCG (3–4 mm). Tear volume of those in the GEH group (6.0±3.2 mm) was found to be almost back to normal, although there was no statistical difference (Figure 8). Figure 8 Schirmer test results after the 3-week treatment. Notes: Results compared with the DES group. Data expressed as mean ± SD (*P<0.05 compared with control, Student’s t-test). Abbreviations: DES, dry-eye syndrome; EGCG, epigallocatechin gallate; GE, gelatin–EGCG; GEH, GE with hyaluronic acid coating. After 3 weeks of treatment, rabbits’ eyes were stained with fluorescein and observed under slit-lamp microscopy. Corneas of healthy rabbits were not stained (Figure 9A). Strong-green staining was present in the core of the corneas treated with 0.1% BAC (Figure 9B). Opaque corneas were found in eyes treated with PBS (Figure 9C), and dim-green staining was present in the central corneas of DES rabbits treated with EGCG solution (Figure 9D). No significant staining of corneas was evident in the GEH NP group (Figure 9E). Figure 9 Slit-lamp photography of rabbit eyes in each group after fluorescein staining. Notes: (A) Untreated control eye with no fluorescent pigment. (B) Eye treated with 0.1% benzalkonium chloride (DES group). (C) Eye treated with PBS. (D) Eye treated with EGCG solution. (E) Eye treated with GEH eye drops. Abbreviations: DES, dry-eye syndrome; EGCG, epigallocatechin gallate; GEH, gelatin–EGCG with hyaluronic acid coating. Corneal staining is used to measure clinical outcomes. The many clinical grading methods include a system recommended by the National Eye Institute/Industry to evaluate corneal staining.45 We used this system to evaluate the condition of corneas in rabbits with DES. High scores indicated more damage to the cornea when recording scores from 0 to the maximum of 15. Table 3 shows grading scores after treatment with the various formulations of EGCG. Normal corneas with almost no staining had the lowest value (1.0±0.5). The score in the DES group was 7.0±0. After treatment with PBS and EGCG, scores declined to 4.0±0 and 3.5±0.5, respectively. Corneas treated with GEH NPs had much lower scores (2.0±1.0) with less staining compared to corneas treated with the other solutions. Note: n=5, means ± SD. Histological staining showed that normal corneas had three to five layers of epithelial cells and compact collagen fibrils in their stroma (Figure 10A). Thinner corneal epithelia with two to three layers were observed in the DES group, with loose collagen structure in the stroma (Figure 10B). Rabbits in the PBS group also had thinner corneal epithelia and loose stomata (Figure 10C). Rabbits treated with EGCG or GEH had normal corneal epithelia with a regular number of layers and thickness (Figure 10D and E). Figure 10F shows corneal epithelial thickness measured in H&E-stained samples. Figure 10 Representative images of H&E-stained corneal sections in the five groups. Notes: (A) Corneal sections from controls, showing three to five epithelial layers. Corneal sections from (B) 0.1% benzalkonium chloride-treated eyes (DES mimic) and (C) PBS-treated eyes, showing destruction of the layered structure and sponge-like stroma. Corneal sections from (D) EGCG- and (E) GEH-treated eyes. (F) Thickness of corneal epithelium layers (*P<0.05 compared with DES). In the normal group, thickness was 49.5±8.2 μm, which agreed with the quantity for normal corneal epithelium.46 After induction of DES with BAC treatment, the thickness of rabbit corneal epithelium was significantly reduced (25.0±4.9 μm, P<0.05), and treatment with PBS was not helpful for the recovery of corneal thickness (37.5±6.2 μm). The thickness of corneal epithelia in rabbits treated with EGCG and GEH was significantly higher than those treated with DES/PBS (48.2±7.3 μm for EGCG and 49.6±3.7 μm for GEH). The TUNEL assay was used to detect apoptosis in the cornea cascades. The stain labels cells with severe DNA damage in dark brown (Figure 11A–E). Data are quantified in Figure 10F. Normal eyes (Figure 11A) displayed fewer TUNEL-positive cells (6.8±3.1, P<0.05). A large number of brown spots, representing apoptotic cells (63.9±17.2), in the corneal basal epithelium and stroma were noted in eyes treated with 0.1% BAC (DES group; Figure 11B). Eyes treated with PBS revealed significantly fewer apoptotic cells (34.2±9.3, P<0.05) in the superficial corneal epithelium (Figure 11C). EGCG treatment slightly but significantly decreased apoptosis (10.8±1.7, P<0.05) of the corneal epithelium compared to the apoptosis observed in eyes with DES (Figure 11D). Eyes treated with GEH NPs (Figure 11E) revealed significantly fewer TUNEL-positive cells (3.7±0.4, P<0.05) compared to the other groups. Figure 11 TUNEL staining of corneal sections from the different groups. Notes: (A) Normal group, (B) DES-treated group, (C) PBS-treated group, (D) EGCG-treated eyes, (E) GEH-treated eyes, and (F) number of apoptotic cells in the cornea (*P<0.05 compared with DES, #P<0.05 compared with GEH). We further examined the inflammation that occurred in corneas using ELISA to confirm inflammatory cytokine concentrations responding to different treatments with the various EGCG formulations (Figure 12). Concentration of cytokines, including TNFα, IL6, IL8, and IL1β, in normal corneas (control) was 8.5±2.8, 34.0±3.7, 626.6±2.5, and 443.0±5.5 μg/mL, respectively. When rabbits were treated with 0.1% BAC to induce DES conditions, the concentrations of TNFα (136.2±24.4 μg/mL), IL6 (133.2±9.6 μg/mL), and IL8 (907.7±116.4 μg/mL) increased considerably compared to normal corneas, and a slight increase in IL1β level (686.9±4.3 μg/mL) was also noted. All these pro-inflammatory cytokine levels were significantly different when compared with values in the normal group (all P<0.05). TNFα and IL6 concentrations (40–70 μg/mL) had decreased in the PBS group (Figure 12A), while there was no change in IL1β or IL8 levels (650–800 μg/mL; Figure 12B). The concentration of TNFα, IL6, and IL8 in inflamed corneas decreased markedly following treatment with EGCG and GEH. In particular, in the GEH group, levels of TNFα (16.5±0.7), IL6 (16.8±0.1), IL1β (593.7±7.6), and IL8 (463.0±1.5) were almost the same as those found in the control group, and the IL6 level was even lower than the control group (Figure 12A). Based on these results, we can conclude that GEH containing 20 μg/mL EGCG can effectively inhibit inflammation in corneas of rabbits with DES when instilled in eye drops twice a day. Figure 12 Levels of inflammatory cytokines from cornea extraction determined by ELISA. Notes: (A) Cytokine concentration of TNFα, IL6; and (B) IL1β, IL 8. The DES group (0.1% benzalkonium chloride) displays much higher concentrations of IL1β, IL8, TNFα, and IL6, and the GEH group displays lower concentrations of the cytokines (*P<0.05 compared with control, #P<0.05 compared with GEH). Ophthalmic solutions, such as eye drops, are popular because of their low cost and high acceptance by patients. However, <5% of the eye drop fluid that is applied actually penetrates the cornea, because of anatomic and physiological barriers.47 Designing a drug-delivery system to target the eye has become a major challenge. Nanocarriers may be a solution to the problem of low dosing in ocular drug-delivery systems.47 Small (≤10 μm) particles eliminate the discomfort experienced with administering large particles.48,49 An ideal particle size to avoid irritation or discomfort and ensure easy uptake by corneal or conjunctival cells is <800 nm.50,51 The GE and GEH NPs synthesized in this study were spheres <350 nm (Table 1, Figure 2A). DES is accompanied by inflammation on the ocular surface.17 Topical delivery of corticosteroids is commonly used to treat DES. However, prolonged use may result in other eye diseases, such as cataracts and glaucoma.52 Therefore, alternate drugs for ocular inflammation management in DES are needed. Polyphenols, especially EGCG, which displays anti-inflammatory behavior, are beneficial to eye health and physiology and help to inhibit DES-related inflammation.21,24,29,53 Protein–EGCG interactions drive the self-assembly of EGCG with albumin–dextran to form NPs.54 EGCG has multiple phenolic hydroxyl groups in its structure,41,55 which drives polyphenol–protein (gelatin) precipitation because of the electrical attraction between EGCG and gelatin-peptide chains, which in turn leads to particle aggregation and the formation of compact spheres at a proper concentration.41,55 Here, gelatin (type A), which is enriched in positive charges, attracted EGCG, which is enriched in OH groups, to form GE-NPs (Figure 1A). 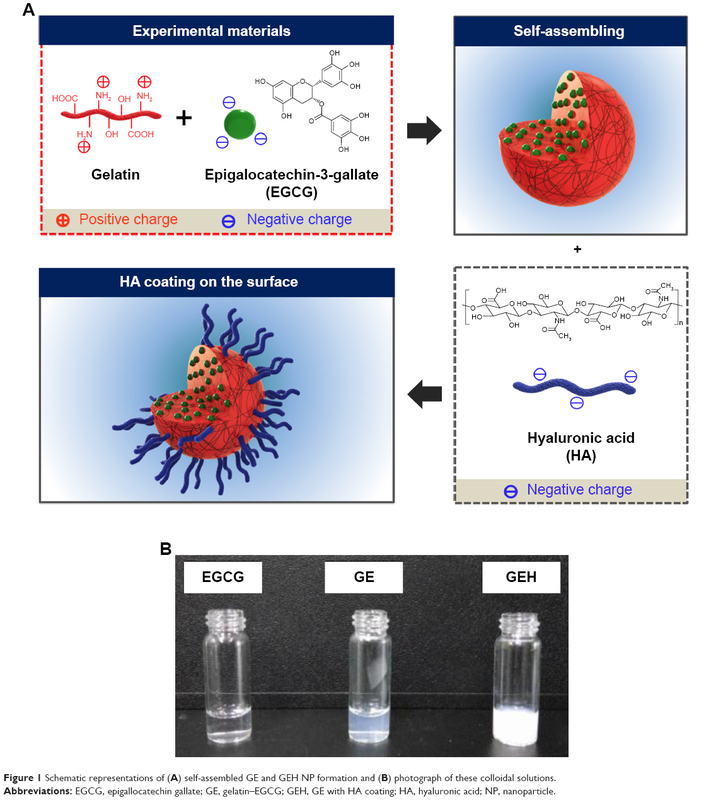 Elsewhere, studies of EGCG loaded in gelatin hydrogels documented that gelatin supplies increased stability and encapsulation capacity for EGCG in aqueous solutions via hydrogen bonds.41,56 EGCG/gelatin NPs facilitated the stability of EGCG during storage or transport. FTIR revealed a gelatin peak >3,300 cm−1 for the hydrogen-bonded hydroxyl groups, and the amide I band was altered to lower frequencies (1,623–1,629 cm−1) in the GE and GEH pattern (Figure 2B). EGCG entered the space of the gelatin polypeptide chains and reinforced intermolecular interaction. The helix-coil transition formation in GE results in increased decomposition temperature of GE or GEH compared with raw gelatin.41,55 We observed that hydrogen bonding ameliorated the thermal properties of gelatin, which resulted in the endothermal peak shifting to higher temperatures (Figure 2C). One of the advantages for NP-mediated drug delivery is controlled release. We confirmed that GE and GEH had a slower release pattern than free EGCG-TAMRA solution (Figure 2D). EGCG-TAMRA was contained in the GE and GEH NPs. This was due to the concentration gradient that limited the outward diffusion of EGCG-TAMRA from particles and to the barrier layer of the surface-coated HA, which slowed down the drug release. The slowest release occurred for GEH, indicating the potential value of GEH to carry EGCG for long-term release. To determine how EGCG in solution or in NPs affected cell viability, various EGCG formulations were evaluated. An EGCG concentration of 20 μg/mL was uniformly nontoxic to HCECs (Figure 3A). The lower cell viability (40% of the original viability) in the GEH group at day 7 reflected the marked accumulation of EGCG in HCECs (Figures 3 and 4). GEH containing 20 μg/mL EGCG and 62.5 μg/mL HA administered as eye drops was tested. Mucins act as a lubricant, stabilizer, and a physical barrier at the ocular surface. Mucoadhesive NPs can enhance the concentration of therapeutics to the front of the ocular region, such as the cornea.14 HA has mucoadhesive properties. 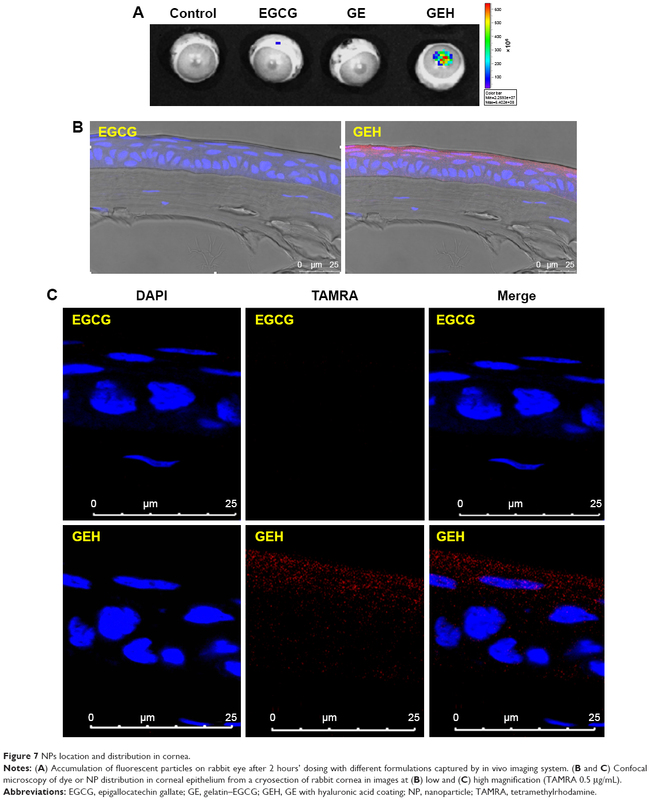 In one study, the combination of HA with chitosan NPs successfully transferred genes to ocular tissue with a high transfection rate without influencing tight junctions.9 In this study, GEH increased the uptake rate of particles and helped in the accumulation of large amounts of GEH NPs in HCECs (Figure 4). Additionally, the slow-release capacity of GEH (Figure 2D) resulted in the significant decline in expression of genes related to inflammation (IL1B, IL6, IL8, and TNFA) in HCECs in the inflammatory environment and was more effective than EGCG solution or GE alone (Figure 5). Normal pH in human tears is neutral. pH values of GE and GEH NPs in PBS were approximately 7. 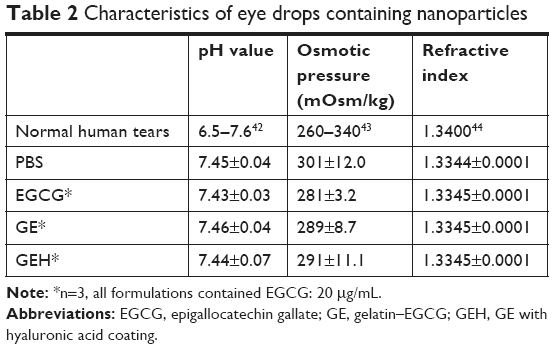 The osmolality of variant EGCG formulations (280–290 mOsm/kg; Table 2) was also in a similar and suitable range, as in tears.43 DES with high osmolality often features tear fluid, the hyperosmolality of which can damage eyes, initiating inflammation and damage to the ocular surface. This is the main mechanism for the development of DES.17,57 The role of HA in providing mucoadhesion was also confirmed in an IVIS examination. The examination revealed a stronger fluorescence signal in GEH-treated eyes, indicating prolonged retention on the eyes (Figures 6 and 7). Fluorescence images taken from rabbit eyes treated with free indocyanine green revealed a dramatic decrease after 3 hours, but the mucoadhesive NPs in eye drops made of poly(D,L-lactic acid) with dextran NPs prolonged retention of drug at the ocular surface, enabling the successful treatment of DES.58 The fluorescence signal of GE or GEH on the ocular surface was traced within 2 hours and was much higher than the dye solution in this study. Considering the rapid clearance of drugs from the ocular surface within the first 20 minutes of the administration of eye drops,58,59 this study demonstrates that GEH NPs can significantly prolong the ocular retention of loaded therapeutics by attachment to the ocular surface. Blinking can influence the residence time of a topically delivered substance applied in the tear film. The blinking rate is every 6 minutes in rabbits and every 5 minutes in mice and rats.60 Longer retention and larger amounts of drug and dye in GEH NPs were observed in rats and rabbits in this study compared to EGCG solution in eye drops. A faster blinking rate can result in decreased residence time on the eyes, although the blinking rate in humans is 5–12/min,60 which is much faster than that of rats and rabbits. As a comparable condition, the relative drug concentration of nanomedicine (GEH NPs) that remains on the ocular surface of the human eye may be higher than the solution type of eye drops. For therapeutic evaluation, measurement of tear secretion and fluorescein staining of the cornea provided insights on DES symptoms. Topical delivery of 0.1% BAC dramatically decreased tear volume in the DES rabbit, but tear production recovered nearly to baseline level in the GEH NP-treated group (Figure 8). Histological sections of the cornea were also examined, which identified signs of inflammation and ocular surface integrity. The corneas of animals treated with PBS and EGCG solution revealed that these two agents were unable to treat DES (Figures 8–12), as evidenced by the pronounced inflammation and corneal epithelium damage on the ocular surface. GPs do not cause any irritation or discomfort after dosing.14 With EGCG loading. there was no discomfort, such as secretion, hemorrhage, or blinking, in rabbits’ eyes. 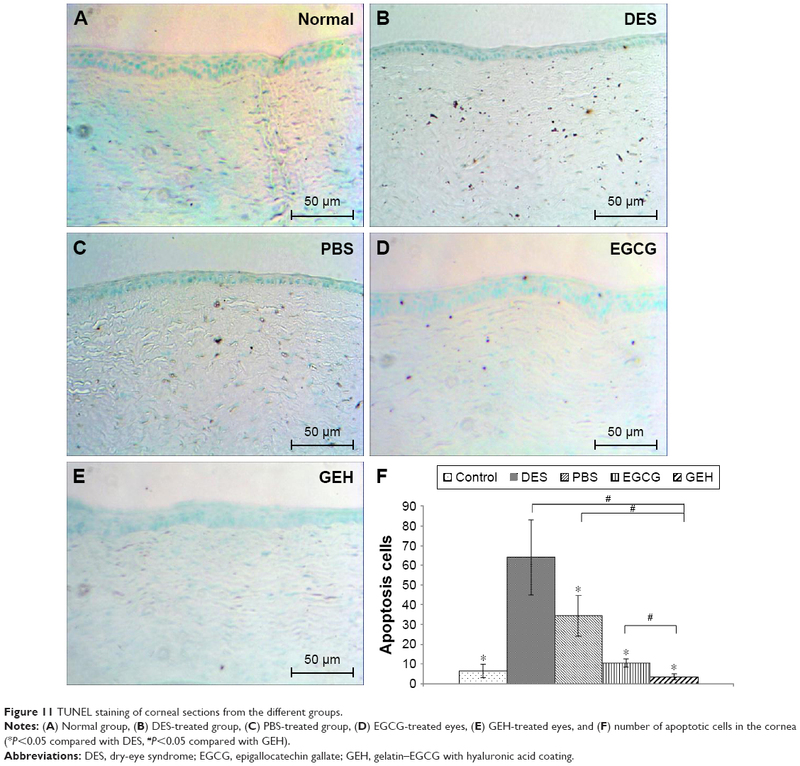 In rabbits that received the GEH eye drops, sustained EGCG release ameliorated BAC-induced corneal epithelial defects by reducing cell apoptosis and suppressing cellular inflammation (Figures 11 and 12). A nanocomplex of polyethylene glycol and catechin (1%) to treat DES was reportedly effective, as evidenced by stabilization of tear film and suppression of inflammation.61 However, to generate these therapeutic effects, polyethylene glycol–catechin nanocomplexes were administered five times a day for 10 days. In our study, GEH NPs required only twice-daily dosing to be therapeutic. 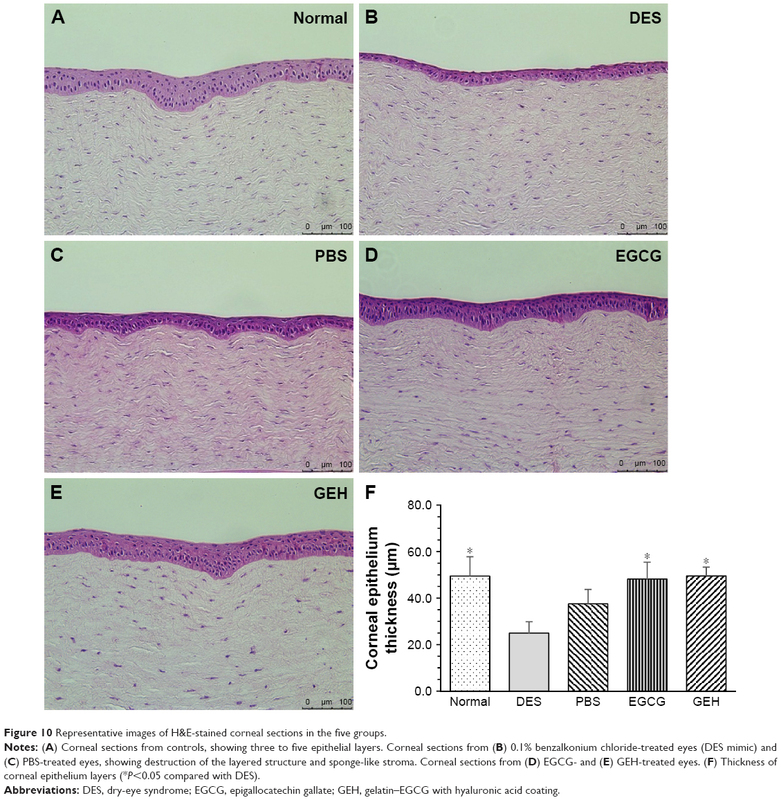 Additionally, a low EGCG concentration was used because of the synthesis effect of the HA added.29 The enhanced therapeutic effects of gelatin–N-isopropylacrylamide copolymer carriers with EGCG (0.1% w:v) for topical administration to treat DES have been proven.46 The authors showed that this combination prevented tear evaporation and enhanced the efficacy of the topically instilled EGCG in situ gel-delivery system to overcome the drawbacks of limited relief of DES by an eye drop formulation.46 Although the dosing frequency (once vs twice daily) and the treatment period (3 days vs 2 weeks) were not the same, the data revealed a better therapeutic effect in the EGCG-gelling system and nanoformulation than EGCG solution. DES is a chronic inflammatory process on the ocular surface, resulting in a shortage of tears. We confirmed the long-term therapeutic effects of GEH NPs as eye drops. These GEH NPs attached easily to the ocular surface. Their uptake by CECs was efficient. They increased drug/dye accumulation in corneal epithelial layers, which increased drug availability on the corneal surface (Figures 6 and 7). Finally, they are easy to use (twice-daily dosing for 2 weeks), with excellent therapeutic outcomes (Figures 8–12). The use of GEH NPs as an eye drop formulation was effective in treating DES rabbits by restoring tear volume back to baseline, repairing damaged epithelial cells, and inhibiting inflammation of the cornea, because of increased drug retention on the ocular surface. The results were enhanced therapeutic outcomes. This is a simple and noninvasive way to cure DES and is quite convenient for daily use by patients at home. GEH NPs were prepared successfully: their particle size and ζ-potential were 253.4±7.3 nm and 9.2±1.8 mV, respectively, and HA concentration was 62.5 μg/mL. Using GEH NPs to treat HCECs at an EGCG concentration of 20 μg/mL was nontoxic. The properties of the GEH eye drops, such as pH, osmolality, and RI, were similar to those of human tears. No ocular discomfort or irritation was observed in rabbits treated with various EGCG formulations after topical delivery. In rabbits with DES, clinical signs improved significantly after GEH treatment due to higher amounts of medicine being retained in the eye. Treatment of rabbit eyes with GEH NP eye drops showed normal architecture and morphology, with a lack of dead cells. Additionally, GEH eye drops reduced inflammation cytokines (TNFα, IL8, IL1β, and IL6) in the cornea, which improved related clinical signs, such as tear secretion and cornea fluorescein staining (Figure 13). The present results show the potential application of EGCG nanomedicine as a new therapeutic agent for treating DES. Figure 13 Schematic diagram of the study protocol. Notes: (A) Synthesis of GEH NPs with EGCG loading for DES treatment in a rabbit model. (B) Inflamed cornea with higher inflammatory cytokine production observed in DES rabbit with low tear production. (C) Effective decrease of cornea inflammation and repair confirmed by GEH taken up by epithelium and use of EGCG inhibitor. Abbreviations: DES, dry-eye syndrome; EGCG, epigallocatechin gallate; GEH, gelatin–EGCG with hyaluronic acid coating; GPs, gelatin NPs. This study was supported by grants from the Ministry of Science and Technology, Taiwan (NSC 102–2221-E-038–007 and MOST 106–2628-E-038–001-MY3) and the Integrated Research Grant in Health and Medical Sciences from the National Health Research Institute, Taiwan (NHRI-EX105-10334EI). Torchilin VP, Trubetskoy VS. Which polymers can make nanoparticulate drug carriers long-circulating? Adv Drug Deliv Rev. 1995;16(2–3):141–155. Binstock EE, Domb AJ. Nanoparticles in ocular drug delivery. In: Domb AJ, Tabata Y, Kumar MNVR, Farber S, editors. Nanoparticles for pharmaceutical applications. California, USA: American Scientific Publishers; 2007:367–376. Davies NM. Biopharmaceutical considerations in topical ocular drug delivery. Clin Exp Pharmacol Physiol. 2000;27(7):558–562. Diebold Y, Jarrín M, Sáez V, et al. Ocular drug delivery by liposome-chitosan nanoparticle complexes (LCS-NP). Biomaterials. 2007;28(8):1553–1564. Kawashima Y, Yamamoto H, Takeuchi H, Kuno Y. Mucoadhesive DL-lactide/glycolide copolymer nanospheres coated with chitosan to improve oral delivery of elcatonin. Pharm Dev Technol. 2000;5(1):77–85. Chaiyasan W, Srinivas SP, Tiyaboonchai W. Mucoadhesive chitosan-dextran sulfate nanoparticles for sustained drug delivery to the ocular surface. J Ocul Pharmacol Ther. 2013;29(2):200–207. De Campos AM, Sánchez A, Alonso MJ. Chitosan nanoparticles: a new vehicle for the improvement of the delivery of drugs to the ocular surface. Application to cyclosporin A. Int J Pharm. 2001;224(1–2):159–168. Bourges JL, Gautier SE, Delie F, et al. Ocular drug delivery targeting the retina and retinal pigment epithelium using polylactide nanoparticles. Invest Ophthalmol Vis Sci. 2003;44(8):3562–3569. de La Fuente M, Seijo B, Alonso MJ. Novel hyaluronic acid-chitosan nanoparticles for ocular gene therapy. Invest Ophthalmol Vis Sci. 2008;49(5):2016–2024. Başaran E, Demirel M, Sirmagül B, Yazan Y. Cyclosporine-A incorporated cationic solid lipid nanoparticles for ocular delivery. J Microencapsul. 2010;27(1):37–47. Gökçe EH, Sandri G, Eğrilmez S, Bonferoni MC, Güneri T, Caramella C. Cyclosporine a-loaded solid lipid nanoparticles: ocular tolerance and in vivo drug release in rabbit eyes. Curr Eye Res. 2009;34(11):996–1003. Djagny VB, Wang Z, Xu S. Gelatin: a valuable protein for food and pharmaceutical industries: review. Crit Rev Food Sci Nutr. 2001;41(6):481–492. Sintzel M, Bernatchez SF, Tabatabay C, Gurny R. Biomaterials in ophthalmic drug delivery. Eur J Pharm Biopharm. 1996;42(6):358–374. Tseng CL, Chen KH, Su WY, Lee YH, Wu CC, Lin FH. Cationic gelatin nanoparticles for drug delivery to the ocular surface: In vitro and in vivo evaluation. J Nanomater. 2013;2013:1–11. Mcdonald CC, Kaye SB, Figueiredo FC, Macintosh G, Lockett C. A randomised, crossover, multicentre study to compare the performance of 0.1% (w/v) sodium hyaluronate with 1.4% (w/v) polyvinyl alcohol in the alleviation of symptoms associated with dry eye syndrome. Eye. 2002;16(5):601–607. Lemp MA, Baudouin C, Baum J, Dogru M, Foulks GN, Kinoshita S. The definition and classification of dry eye disease: report of the Definition and Classification Subcommittee of the International Dry Eye WorkShop. Ocul Surf. 2007;5(2):75–92. Yoon KC, de Paiva CS, Qi H, et al. Expression of Th-1 chemokines and chemokine receptors on the ocular surface of C57BL/6 mice: effects of desiccating stress. Invest Ophthalmol Vis Sci. 2007;48(6):2561–2569. Wilson SE, Perry HD. Long-term resolution of chronic dry eye symptoms and signs after topical cyclosporine treatment. Ophthalmology. 2007;114(1):76–79. Luo L, Li DQ, Doshi A, Farley W, Corrales RM, Pflugfelder SC. Experimental dry eye stimulates production of inflammatory cytokines and MMP-9 and activates MAPK signaling pathways on the ocular surface. Invest Ophthalmol Vis Sci. 2004;45(12):4293–4301. Larrosa M, Lodovici M, Morbidelli L, Dolara P. Hydrocaffeic and p-coumaric acids, natural phenolic compounds, inhibit UV-B damage in WKD human conjunctival cells in vitro and rabbit eye in vivo. Free Radic Res. 2008;42(10):903–910. Cavet ME, Harrington KL, Vollmer TR, Ward KW, Zhang JZ. Anti-inflammatory and anti-oxidative effects of the green tea polyphenol epigallocatechin gallate in human corneal epithelial cells. Mol Vis. 2011;17:533–542. Gillespie K, Kodani I, Dickinson DP, et al. Effects of oral consumption of the green tea polyphenol EGCG in a murine model for human Sjogren’s syndrome, an autoimmune disease. Life Sci. 2008;83(17–18):581–588. Lee HS, Chauhan SK, Okanobo A, Nallasamy N, Dana R. Therapeutic efficacy of topical epigallocatechin gallate in murine dry eye. Cornea. 2011;30(12):1465–1472. Fangueiro JF, Calpena AC, Clares B, et al. Biopharmaceutical evaluation of epigallocatechin gallate-loaded cationic lipid nanoparticles (EGCG-LNs): In vivo, in vitro and ex vivo studies. Int J Pharm. 2016;502(1–2):161–169. Chang CY, Wang MC, Miyagawa T, et al. Preparation of arginine-glycine-aspartic acid-modified biopolymeric nanoparticles containing epigalloccatechin-3-gallate for targeting vascular endothelial cells to inhibit corneal neovascularization. Int J Nanomed. 2017;12:279–294. Re R, Pellegrini N, Proteggente A, Pannala A, Yang M, Rice-Evans C. Antioxidant activity applying an improved ABTS radical cation decolorization assay. Free Radic Biol Med. 1999;26(9–10):1231–1237. Shutava TG, Balkundi SS, Lvov YM. (–)-Epigallocatechin gallate/gelatin layer-by-layer assembled films and microcapsules. J Colloid Interface Sci. 2009;330(2):276–283. Tseng CL, Hung YJ, Chen ZY, Fang HW, Chen KH. 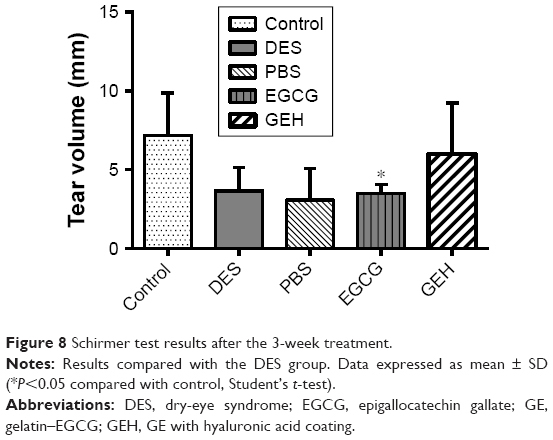 Synergistic Effect of Artificial Tears Containing Epigallocatechin Gallate and Hyaluronic Acid for the Treatment of Rabbits with Dry Eye Syndrome. PLoS One. 2016;11(6):e0157982. Xiong C, Chen D, Liu J, et al. A rabbit dry eye model induced by topical medication of a preservative benzalkonium chloride. Invest Ophthalmol Vis Sci. 2008;49(5):1850–1856. Tseng CL, Chen ZY, Renn TY, Hsiao SH, Burnouf T. Solvent/detergent virally inactivated serum eye drops restore healthy ocular epithelium in a rabbit model of dry-eye syndrome. PLoS One. 2016;11(4):e0153573. Li N, Deng X, Gao Y, Zhang S, He M, Zhao D. Establishment of the mild, moderate and severe dry eye models using three methods in rabbits. BMC Ophthalmol. 2013;13(1):50. Yeh S, Song XJ, Farley W, Li DQ, Stern ME, Pflugfelder SC. Apoptosis of ocular surface cells in experimentally induced dry eye. Invest Ophthalmol Vis Sci. 2003;44(1):124–129. Almedia PF, Lanes SCS, Calarge FA, Farias TMB, Santana JCC. FTIR characterization of gelatin from chicken feet. J Chem Chem Eng. 2012;6:1029–1032. Chen M, Tan J, Lian Y, Liu D. Preparation of Gelatin coated hydroxyapatite nanorods and the stability of its aqueous colloidal. Appl Surf Sci. 2008;254(9):2730–2735. Chen YC, Yu SH, Tsai GJ, Tang DW, Mi FL, Peng YP. Novel technology for the preparation of self-assembled catechin/gelatin nanoparticles and their characterization. J Agric Food Chem. 2010;58(11):6728–6734. Zhu B, Li J, He Y, Yoshie N, Inoue Y. Hydrogen-Bonding Interaction and Crystalline Morphology in the Binary Blends of Poly(ε-caprolactone) and Polyphenol Catechin. Macromol Biosci. 2003;3(11):684–693. Garcia J, Hsieh MF, Doma B, Peruelo D, Chen IH, Lee HM. Synthesis of gelatin-γ-polyglutamic acid-based hydrogel for the In vitro controlled release of epigallocatechin gallate (EGCG) from Camellia sinensis. Polymers. 2014;6(1):39–58. Honda Y, Tanaka T, Tokuda T, et al. Local controlled release of polyphenol conjugated with gelatin facilitates bone formation. Int J Mol Sci. 2015;16(6):14143–14157. Deng Y, Ren J, Chen G, et al. Injectable in situ cross-linking chitosan-hyaluronic acid based hydrogels for abdominal tissue regeneration. Sci Rep. 2017;7(1):2699. Liu H, Jiao Z, Guo S. Effect of Epigallocatechin Gallate on the Properties of Gelatin. Int J Food Prop. 2014;17(10):2119–2130. Abelson MB, Udell IJ, Weston JH. Normal human tear pH by direct measurement. Arch Ophthalmol. 1981;99(2):301. Craig JP, Simmons PA, Patel S, Tomlinson A. Refractive index and osmolality of human tears. Optom Vis Sci. 1995;72(10):718–724. Luo LJ, Lai JY. Epigallocatechin Gallate-Loaded Gelatin-g-Poly(N-Isopropylacrylamide) as a New Ophthalmic Pharmaceutical Formulation for Topical Use in the Treatment of Dry Eye Syndrome. Sci Rep. 2017;7(1):9380. Nagarwal RC, Kant S, Singh PN, Maiti P, Pandit JK. Polymeric nanoparticulate system: a potential approach for ocular drug delivery. J Control Release. 2009;136(1):2–13. Shinde UA, Shete JN, Nair HA, Singh KH. Eudragit RL100 based microspheres for ocular administration of azelastine hydrochloride. J Microencapsul. 2012;29(6):511–519. Souza JG, Dias K, Pereira TA, Bernardi DS, Lopez RF. Topical delivery of ocular therapeutics: carrier systems and physical methods. J Pharm Pharmacol. 2014;66(4):507–530. Calvo P, Alonso MJ, Vila-Jato JL, Robinson JR. Improved ocular bioavailability of indomethacin by novel ocular drug carriers. J Pharm Pharmacol. 1996;48(11):1147–1152. Qaddoumi MG, Ueda H, Yang J, Davda J, Labhasetwar V, Lee VH. The characteristics and mechanisms of uptake of PLGA nanoparticles in rabbit conjunctival epithelial cell layers. Pharm Res. 2004;21(4):641–648. Ridolo E, Montagni M, Caminati M, Senna G, Incorvaia C, Canonica GW. Emerging drugs for allergic conjunctivitis. Expert Opin Emerg Drugs. 2014;19(2):291–302. Khan N, Mukhtar H. Tea polyphenols for health promotion. Life Sci. 2007;81(7):519–533. Li Z, Gu L. Fabrication of self-assembled (-)-epigallocatechin gallate (EGCG) ovalbumin-dextran conjugate nanoparticles and their transport across monolayers of human intestinal epithelial Caco-2 cells. J Agric Food Chem. 2014;62(6):1301–1309. Kosaraju SL, Puvanenthiran A, Lillford P. Naturally crosslinked gelatin gels with modified material properties. Food Res Int. 2010;43(10):2385–2389. Gómez-Mascaraque LG, Soler C, Lopez-Rubio A. Stability and bioaccessibility of EGCG within edible micro-hydrogels. Chitosan vs. gelatin, a comparative study. Food Hydrocoll. 2016;61:128–138. Potvin R, Makari S, Rapuano CJ. Tear film osmolarity and dry eye disease: a review of the literature. Clin Ophthalmol. 2015;9:2039–2047. Liu S, Dozois MD, Chang CN, et al. Prolonged ocular retention of mucoadhesive nanoparticle eye drop formulation enables treatment of eye diseases using significantly reduced dosage. Mol Pharm. 2016;13(9):2897–2905. Di Tommaso C, Valamanesh F, Miller F, et al. A novel cyclosporin a aqueous formulation for dry eye treatment: in vitro and in vivo evaluation. Invest Ophthalmol Vis Sci. 2012;53(4):2292–2299. Zevina M. Ocular anatomy and variations in laboratory animals. In: Weir AB, Collins M, editors. Assessing ocular toxicology in laboratory animals. New York: Humana Press; 2013. Lee H, Shim W, Kim CE, Choi SY, Lee H, Yang J. Therapeutic efficacy of nanocomplex of poly(ethylene glycol) and catechin for dry eye disease in a mouse model. Invest Ophthalmol Vis Sci. 2017;58(3):1682–1691. After human corneal epithelium cells (HCECs) had been treated with variant epigallocatechin gallate (EGCG) formulations at certain times, cells were trypsinized and collected into a 1.5 mL Eppendorf tube. Trizol (1 ml) was added to the tube, left at 4°C for 1 hour, then centrifuged at 14,000 rpm for 30 minutes at 4°C. Chloroform (200 μL) was added and the tube shaken vigorously by vortex for 1 minute, then put on ice for 3 minutes. This protocol was repeated four times and the tube put on ice for 10 minutes and then centrifuged. The supernatant was transferred to the other tube, isopropanol added, the tube gently shaken, then kept on ice for 10 minutes. After centrifugation at 14,000 rpm for 30 minutes (4°C), the supernatant was removed and 1 mL 75% alcohol added, allowed to react for 3 minutes, and then centrifuged again. The supernatant was removed and left alone for 5 minutes to evaporate the residual ethanol. RNase-free water (10 μL) was added to dissolve the RNA. RNA concentration was then calculated as the ratio of absorbance at A260:A280. Add 10 μL of 2X RT Master Mix to the strip tubes, then added different groups of RNA samples (10 μL), pipetting for several times, then centrifuged for 3 minutes. These samples were then put in the mechanism and setting the thermal cycle for reverse-transcription followed by the direction. The temperature was set as: first stage at 25°C for 10 minutes, second stage for 120 minutes at 37°C, third stage kept at 85°C for 5 minutes, and finally placed in a 4°C refrigerator for further use. The 20 μL cDNA was mixed with 80 μL of nuclease-free H2O to prepare a cDNA templating. Add 10 μL of Master Mix, 4 μL of Nuclease-free H2O, 1 μL of Probe (IL1B, IL6, IL8, TNFA and GAPDH), and 5 μL of cDNA sample to the strip tubes. These samples were centrifuged for 3 minutes, and then put into the real-time LightCycler 96 PCR system (Hoffman-La Roche, Basel, Switzerland) for the reaction. Temperature settings were as follows: first stage, 95°C for 600 seconds, then the second stage at 95°C for 10 seconds plus 60°C for 30 seconds. The second stage was repeated for 45 cycles.